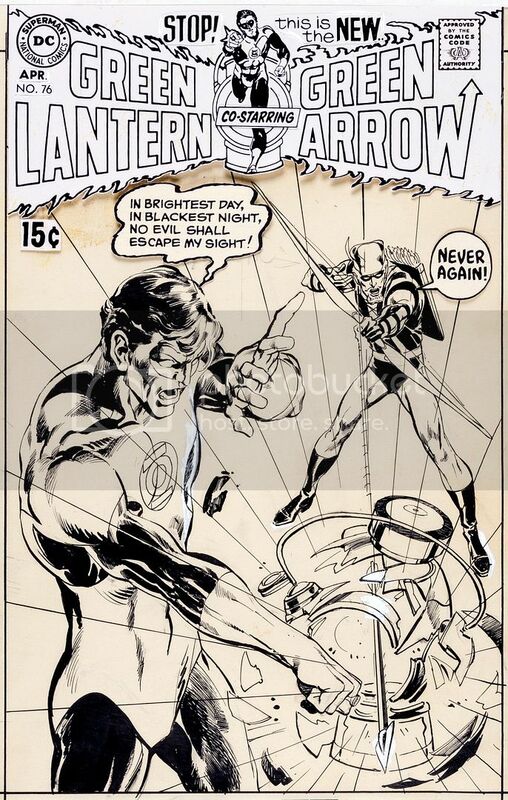 Neal Adams Green Lantern #76 Cover Green Arrow Original Art (DC, 1970). One of the most "Key" of all key Bronze Age books! The effect that Neal Adams had on the comic industry as it transitioned from the Silver Age to the Bronze Age was enormous. Every character he touched, even just on the covers (such as Superman and Superboy) were reinvigorated, and this is without a doubt the most memorable and important cover the great artist ever crafted... ushering in the Bronze Age and an entirely new approach to socially relevant comics storytelling. Last edited by mrhan; 10-16-15 at 11:55 AM. Currently up to $180,000.00. Awesome. Original art is quickly getting insanely more expensive than original issues. That's amazing that it's survived so long in such good condition. Classic cover. Makes sense, due to scarcity, but I agree that the increases seem... high. Wish I'd had more money ten years ago when there were (it now appears) some extremely good deals. $200,000 is the current bid. While it is an iconic cover by a legendary artist, the buyer is banking on Green Arrow and Green Lantern remaining popular for years. I get the feeling that Green Arrow becomes a less bankable character once the show ends its run. Your probably right. To me it's all about the artist and his work. I would rather own one of his vintage Conan art than GL/GA any day. Though, I wouldn't mind owning that particular cover. His work on Conan is way better. I think it's less about Green Lantern and Green Arrow the characters remaining popular, and more about whether Neal Adams and that particular run of comics remains popular. Neal Adams is a bonafide legend and that cover is probably his signature piece. At the very least it's his signature non-Batman piece. As long as people care about Neal Adams, that cover will retain it's value. The show is irrelevant. The people who watch Arrow on the CW are not the people shelling out 200k for a cover like that. edit: and just to add, this thing will end up selling for way more than 200k. I'd be surprised if it didn't hit at least 500k. Last edited by rocket1312; 11-06-15 at 09:54 AM. Plus a 19.5% buyers premium as well. This is a historic cover in the comic book world. It's one of those iconic covers people know about in the industry, done by one of the most famous artist ever in the industry. It's also one of a kind. The characters' current or future popularity is almost irrelevant. It's more about this cover being the one from the famous Green Lantern/Green Arrow book that started the Traveling Heroes storyline / run and the artist who drew it. It seems to be a good investment since this will always have high resale value and people have been going crazy for original artwork in the past 10 years. 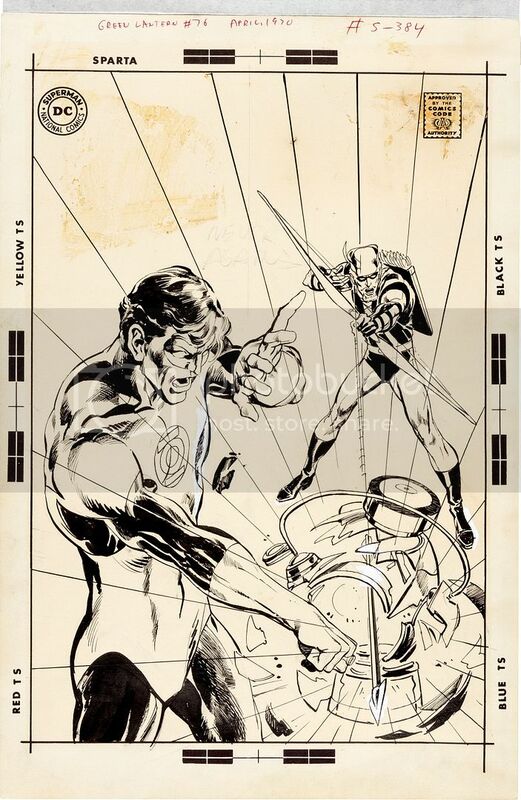 Original artwork from people like Neal Adams, Jack Kirby, Ditko, Steranko, Trimpe and Wrightson tends to sell in the thousands of dollar price. The more famous the issue, the more the original artwork goes for. Missed it by just a couple bucks. View Next Unread What's the most popular super hero introduced in the last 25 years?